So sorry for the silence, but the past week or so has just been one big whirlwind. I wanted to focus my entire attention on preparing for and enjoying my first Fashion Week. I had so much anxiety leading up to the trip, that I wanted to make sure everything was organized and prepared for the weekend. One thing I learned once I got to NYC though, was no matter how much you prepare, Fashion Week rarely goes according to plan. You'll find out more about this as you read my daily recaps. I decided to break the trip recap down into four parts. One post per day. Each day was so jam packed with events, meetings, shows and fun, that I didn't want to shove everything into one post or leave anything out. So over the next week and a half, I'll be sharing four recap posts breaking down each day. I'll also mix a few outfits in between, and some non-fashion week related posts as well. Let's start with Day One shall we? 3:00 a.m. // Wake up call in DC. I set four alarms so I wouldn't oversleep. But they weren't necessary. I actually woke up around 2:45 a.m. and decided to just get up. I was so anxious about missing the train, that I woke up just about every hour throughout the night. Worst night of sleep, ever. 4:00 a.m. // After getting ready and packing the last few things, I Ubered over to Union Station to meet the girls. Little did I know this would be the first of probably 20 something Uber rides over the next four days. Next year I'm going to look into Uber sponsoring our trip or a personal chauffeur, haha! 4:47 a.m. // When they say trains leave exactly on time, they weren't kidding. The train was set to leave at 4:47 a.m. and it pulled out of the station at exactly that time. The four of us were so lucky to find four seats together, and an area to store all of our bags right next to us. Ironically enough, we weren't nearly this lucky or fortunate during our return trip. But I'll save that story for the Day Four recap. 8:15 a.m. // The train arrived exactly on time to Penn Station in New York. Three of us had our first show starting at 9:00 a.m., and then Jenn had her first show starting at 10:00 a.m. So poor Jenn got stuck Ubering to the hotel with all of our luggage. 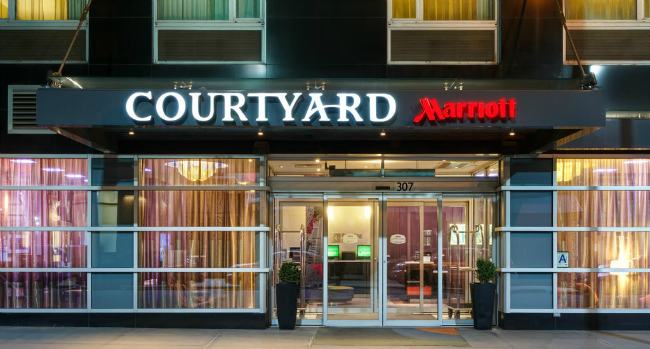 Thankfully she was greeted by a super nice bellman at our Courtyard by Marriott Times Square West hotel. Thanks again Jenn for being such a trooper! Special thanks to Courtyard Marriott and Bryson for a fabulous stay. Everyone was seriously so kind, courteous and helpful. Pretty sure we drove them nuts with our multiple towel and coffee requests, but they were always so friendly and nice! 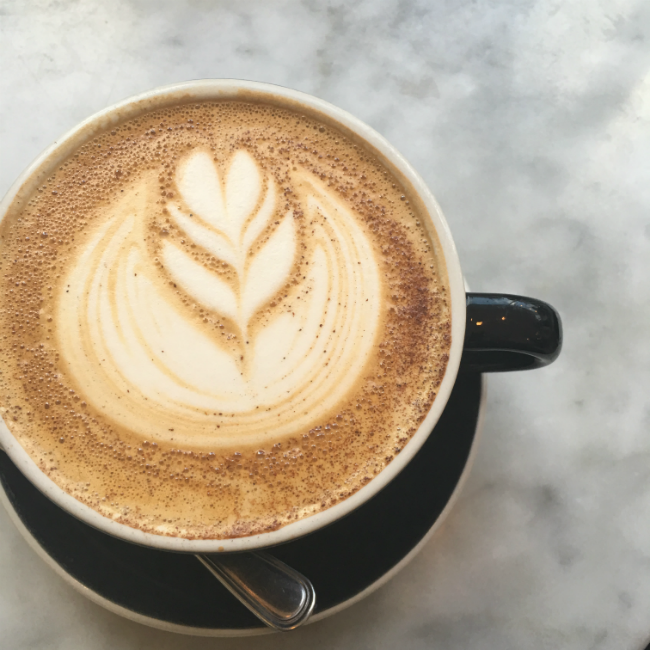 9:00 a.m. // Laura, Lauren and I finally made it to Skylight at Moynihan Station, home to the major fashion week runway shows. Laura and Lauren had standing tickets for Nicholas K, and I had a seated ticket. So we parted ways into two lines. For those of you wondering, when you receive an invite to a show, you initially receive a confirmation number. Then a day or two prior to the show, you'll receive another email letting you know whether you have a seat at the show, or if you'll be standing. Standing tickets just mean that there's a possibility you could sit down, but you have to wait till it's time to fill in the open seats. People towards the back of the standing line generally end up standing. At the smaller shows though, most people will get a seat. Standing tickets just have to wait and fill in where necessary. 9:55 a.m. // The show was supposed to start at 9:00 a.m., but didn't end up starting till about 9:45 a.m. I was supposed to be on the third row for Nicholas K, but ended up scooting down to the first row!! Oh my gosh y'all. I was in utter sock that I was on the front row for my first runway show, ever! I will never forget this moment. The photo is kind of blurry, but this is the final walk featuring the best looks from their collection. 10:00 a.m. // Once the show was over, the three of us walked back to our hotel to check-in and change before lunch. 10:45 a.m. // Jenn met us back at the hotel and then we all Ubered down to SoHo for lunch at the famous, Laduree SOHO. 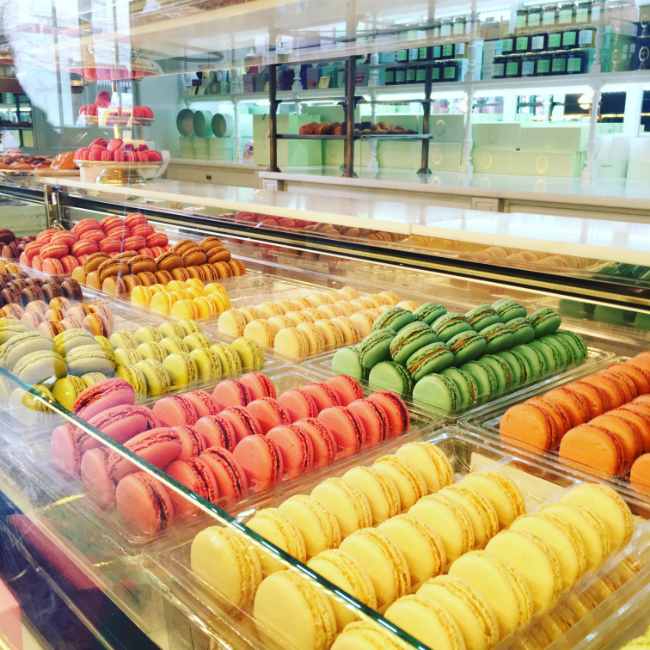 Known for their french cuisine, but more importantly the best tasting macarons in the world. 11:00 a.m. // It was so good to finally sit down and chill after our whirlwind of a morning. While we waited for our food, Lauren and I snapped a few outfit photos out on their heated porch. We knew it would be the warmest location we shot all weekend, so we wanted to take advantage of the natural light where it was warm and enclosed, ha! You'll see these photos in an outfit post next week. 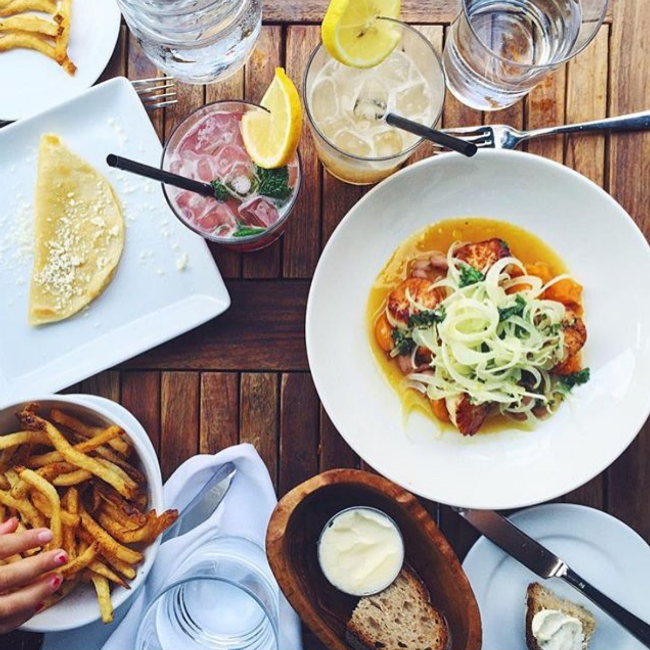 1:00 p.m. // We left our delicious lunch to cab back uptown to meet with the jewelry brand, Lydell. 1:35 p.m. // We arrived to Lydell a few minutes late, as traffic was undoubtedly a nightmare. We were quickly learning that we had to allot way more time to get from point A to point B. 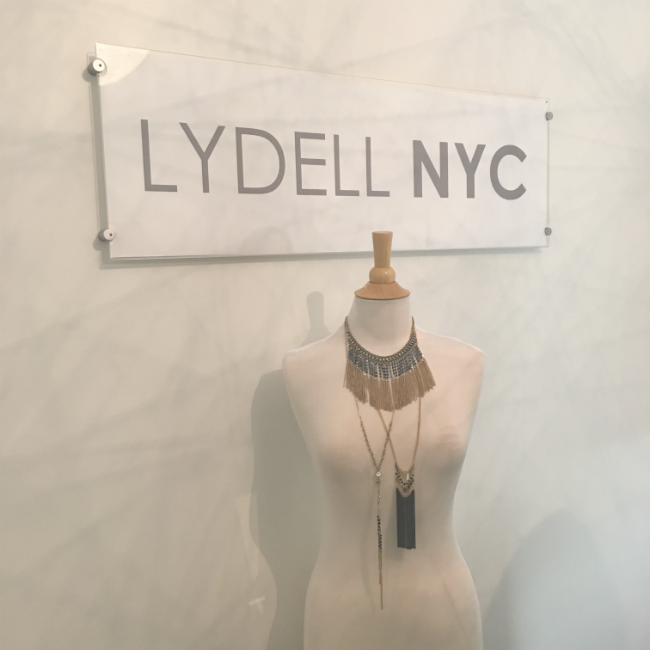 We met with two Lydell NYC reps. 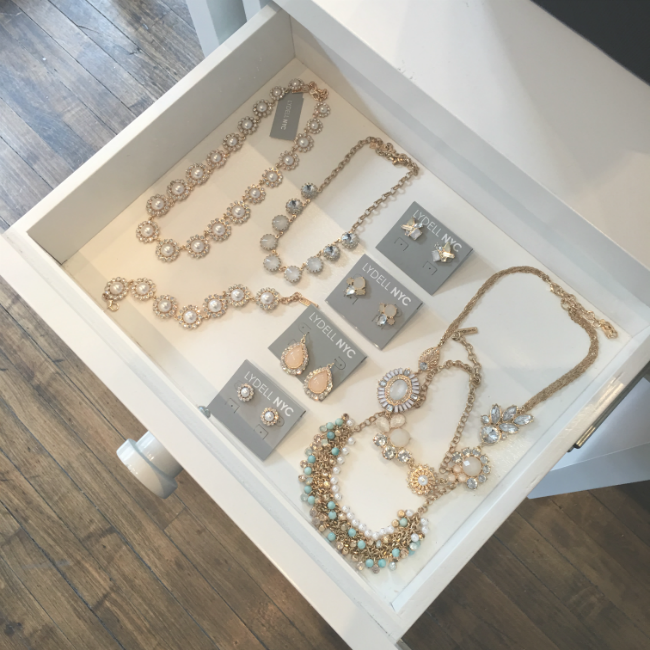 The girls showed us around their showroom, which was broken down by collection. 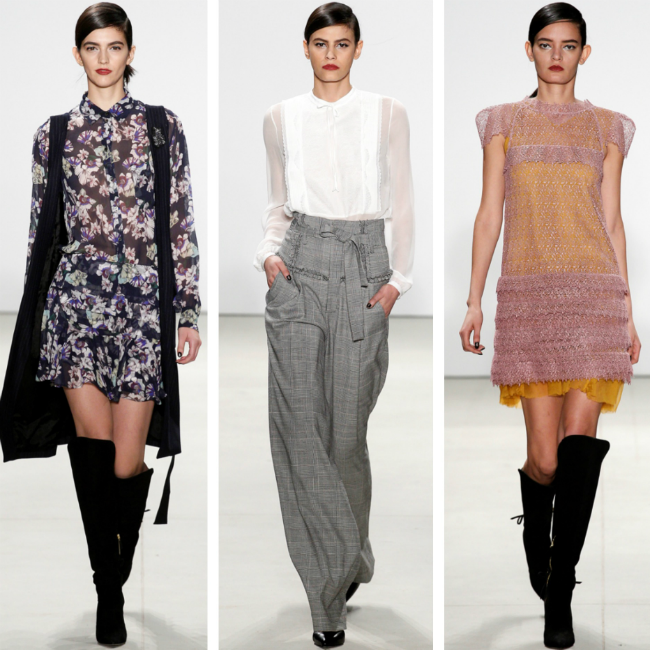 Each collection was based on a type of NYC girl. Everyone from your Boho chic gal, to your glitz and glamour gal were represented. 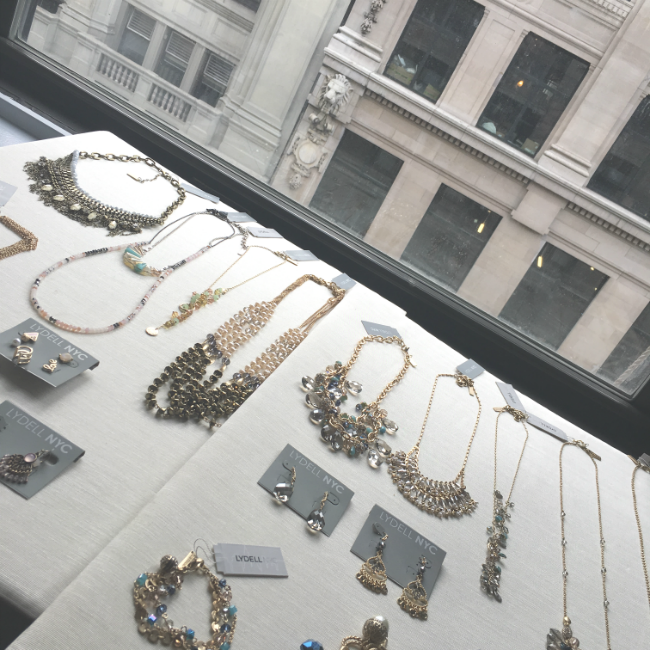 We also got a sneak peek at their new summer collection (which I just so happened to snag a tassel necklace from, eekk!). Sadly we were in a rush to get to our next runway show, so we had to sneak out shortly before 2:00 p.m. We then had to head back downtown to where the Marissa Webb show was set to be held. Clearly we need to do a better job of planning out our day and routes. We spent a ton of time going back and forth from lower Manhattan to Midtown. This took up a lot of our day and cost quite a bit since Uber was surge pricing most of the day. 2:30 p.m. // We arrive to the Skylight at Clarkson Square location. The smaller of the two main Fashion Week venues. We checked in and waited in the standing room line. We were starting to realize we'd be doing a lot of waiting and standing in heels. We clearly had no idea, nor thought the whole standing in heels all day thing through very well. Oops. 3:00 p.m. // When Marissa Webb was supposed to start her show, but we also realized at this point that shows rarely start on time. They open the front line to then herd us all to another standing room section. Thankfully the four of us were at the front of the standing line, so that when they finally ushered us into the main room, we were quickly given seats instead of having to stand. Eekk, thank goodness!! We were all so thankful to have a seat and rest our feet for a bit. 3:35 p.m. // Show finally starts and we're all in awe. 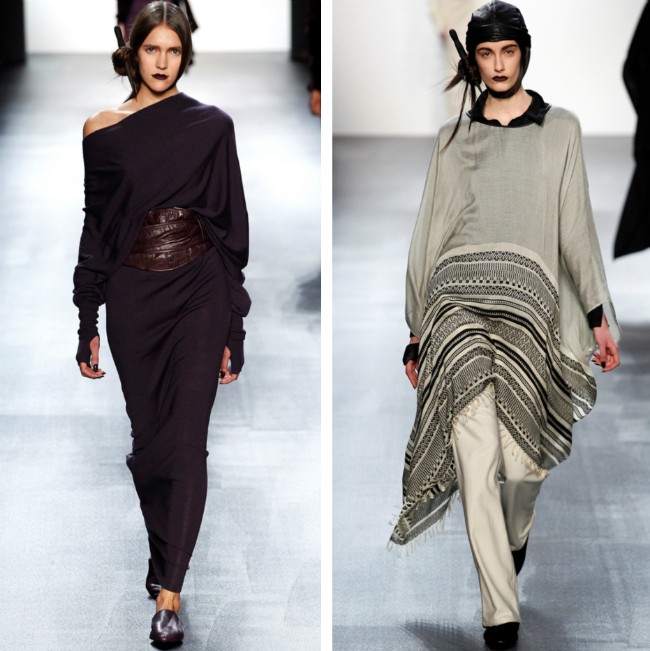 Marissa Webb was at the TOP of our list to attend, as her clothing is all about ready-to-wear. You can literally take the clothing off the models and wear them in real life. The pieces are not wild, crazy or far fetched outfits. That's what I love about her as a designer. You may recognize Marissa Webb and her style, as she was most recently the creative director for Banana Republic and a past designer for J.Crew. So her personal collections mirror these stores quite well. Can it be fall again already?! Or at the very least can I purchase the above coat and army green ensemble now? Would wear every single piece in these outfits. Love, love! 4:05 p.m. // We finally made it out of the building and into an Uber. At this point the temps outside had drastically dropped. The wind had also picked up. So the weather made for four unhappy campers, ha! 4:10 p.m. // We arrived at a coffee shop not too far away to meet with one of the co-founders of Dressometry. It's a really cool website where you can search by style of dress and color. You're able to search hundreds of store websites, all from one central site. It's a really cool concept, and I'll be sharing more about Dressometry in an individualized post very soon. 5:10 p.m. // Coffee was finished and we were exhausted. The 3:00 a.m. wake up call was really hitting all of us at this point. Even after a coffee reload. We Ubered back to the hotel and rested for a bit, before changing and heading out to dinner. 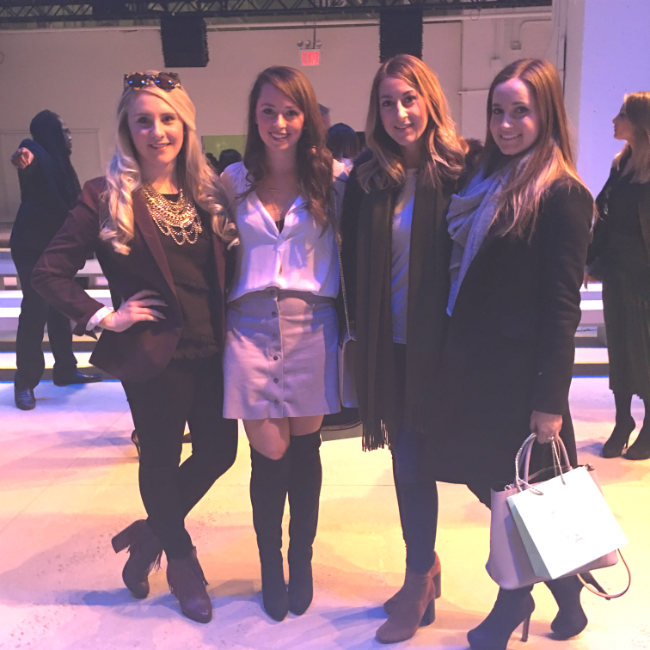 We met up with one of my sweet NYC blogger friends, Dana from Pink Champagne Problems. Dana used to live in DC and that's originally how we met. We have kept in touch over the years via social media, so it was so nice to finally hangout in person again. It had been too long! 8:45 p.m. // Dinner was fun, but you could clearly sense the low energy. We were all exhausted, tired and ready for bed. So we decided to skip out on after dinner drinks and head back to the hotel. I don't think we were back in the room for 10 minutes before it was lights out and we all fell asleep. WOW, what a day. We were up for almost 20 hours straight, with barely any downtime. It was only day one, but we were determined to push through the tiredness and sore feet. I'll be sharing our Day Two recap this Friday, but first... a brand new outfit post featuring Rent the Runway, coming your way tomorrow! So glad to hear Morgan!! 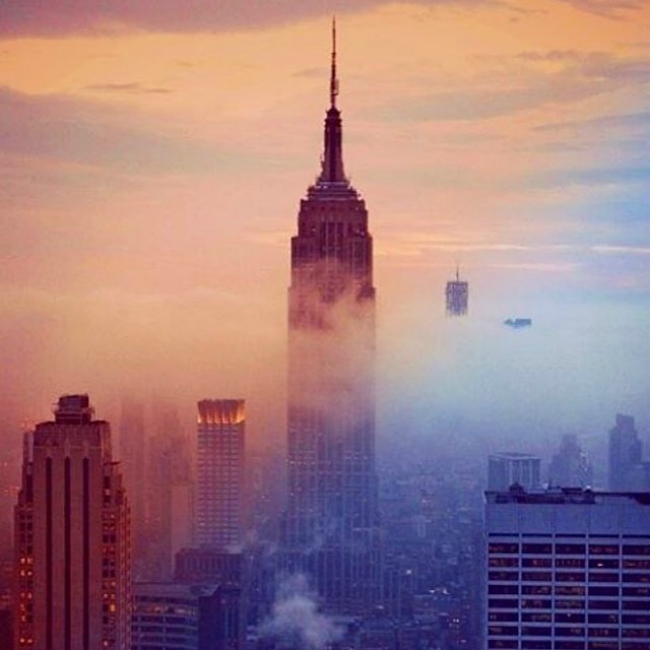 Thanks for reading :)) I definitely plan to share my tips and NYFW takeaways with everyone. Will be sure to include how we connected with PR companies, received ticket/show invites, and tips for other bloggers wanting to attend in the fall. This post will go LIVE on March 1st, so be on the lookout for it!! Thanks again for reading, xo!! Ahhh loved this recap ;) Still SO happy I got to spend some time with you fabulous ladies! Great recap, love your chunky heeled booties! Me too!!! So, so glad! Can't wait for you to make a trip down to DC soon and I'll def be back up to NYC very, very soon!! Oh man, you guys had a crazy first day! And I'm sure you didn't get much sleep going into day two either :) It sounds like a great time though! 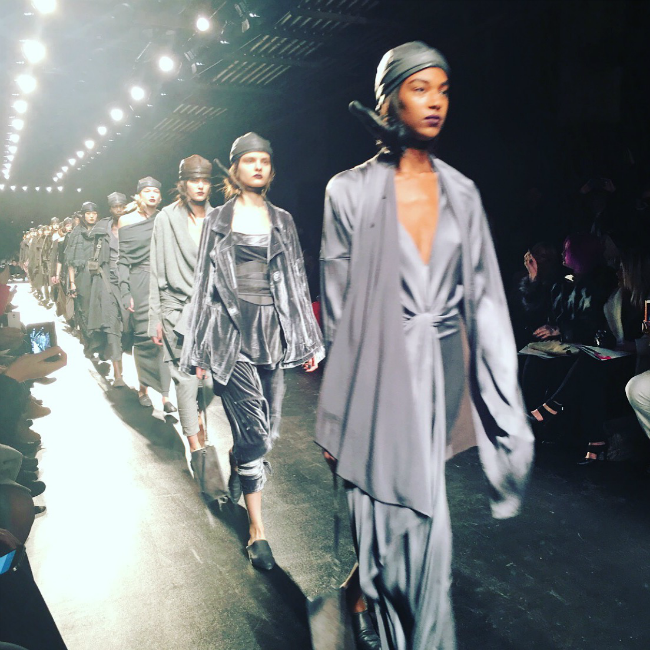 What an awesome experience to be so close to the runway at a NYFW show! !